Occasionally, checking Twitter is like strolling through an art museum. 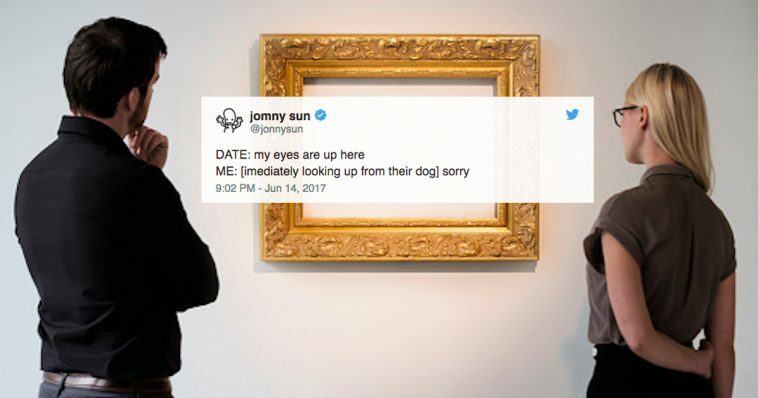 Well, an art museum littered with stinking piles of trash, anyway. Sure, you might have to maneuver around heaping piles of garbage, but every so often, you’ll find yourself delighted by and appreciative of a particular masterpiece. Here are just some of Twitter’s own masterpieces. me: yeah nice nice and she definitely won't find me? bank teller: ok its.. its.. its my birthday.. it’s 11, 07..
me: wait, are you a scorpio? teller: lmaoo omg u totally seem like one!! "Can't, getting my brakes fixed"
"Can everyone just stop?" I plead. I frantically gesture at everything. waiter: we only have tap water, is that okay? COFFEE: I’ll take it from here!!!! ME: Alexa, am I drunk? DOG 1: sometimes mine throws the ball, but then magically it’s back in his hand!